Welcome To Chimney Rock, NC! Located a short drive from Asheville, NC along nearly three miles of the Rocky Broad River at the base of Chimney Rock Mountain sits Chimney Rock Village. This picturesque community neighbors Lake Lure and is at the center of historic Hickory Nut Gorge. The village of Chimney Rock is full of friendly locals, charming shops and restaurants, and breathtaking views of the mountains from its many peaceful riverside walking trails. Main Street features the entrance to the magnificent Chimney Rock State Park, which attracts appreciative visitors most of the year, predominately during the Summer tourist season from Memorial Day through Labor Day, and again in the fall months of October and November when the changing leaves make Chimney Rock and Hickory Nut Gorge explode in a feast of color. The late fall season is novel compared to other mountain areas because of the village’s location within an isothermal belt. Tourists also flock to the area for Chimney Rock’s celebrated Halloween and Christmas events, making this tranquil village the perfect place to get away, whether for annual vacations or as a permanent place to call home. Seeing is believing, so if you’re thinking of moving to or vacationing in the area, don’t forget to visit Chimney Rock Village – it’s likely you’ll never want to leave. 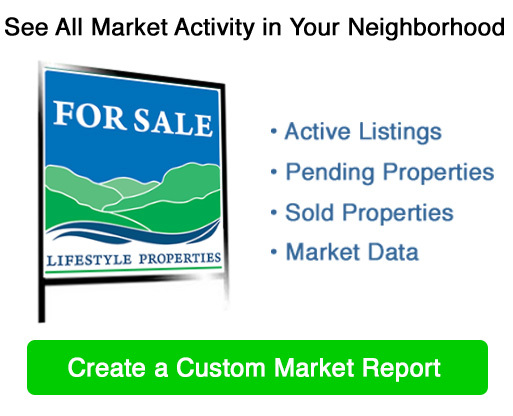 Contact Lifestyle Properties when you’re ready to buy or sell mountain and lake homes and properties in Lake Lure, NC, Chimney Rock, the Hickory Nut Gorge area and other neighboring towns in western North Carolina. We will work hard to sell your home or find you the perfect lake, valley or mountain home of your dreams! Call or email us anytime, or stop by our Lake Lure office at 2975 Memorial Highway, Mon-Sat, 9am-5pm and let’s get started! Our website features the best Chimney Rock real estate search for homes, condos, land and foreclosure properties available. It is the only site you will ever need! It is easy-to-use and updated by the official Realtor’s database every 15 minutes. Listing courtesy of Weichert Realtors Mountain Executives. Listing courtesy of Pinnacle Sothebys International Realty.